Riwaaj is considered to be leading and well known designer boutique in Pakistan. The main product lines of Riwaaj are formal wear, casual wear, semi formal wear and bridal wear. Every year, this designer boutique showcased wide variety of collections for women and young girls. The main objective of Riwaaj to provide high quality dresses at reasonable prices. Recently, Riwaaj has launched latest and exclusive Eid collection for women and young girls. This Eid collection by Riwaaj is extremely elegant and beautiful. Riwaaj Eid collection includes all types of fashion dresses. We would to mention that Eid collection by Riwaaj includes wide range of a-line shirts, long shirts, long kurtis and shalwar kameez. All those women and young girls who love to wear Riwaaj collections they should give a quick look at the latest Eid collection by Riwaaj. 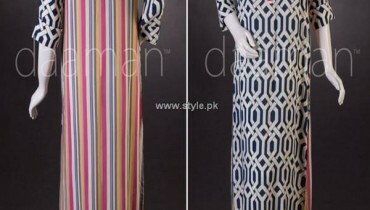 In this collection, Riwaaj used attractive and bright colors like blue, red, white, pink etc. In this post, we are sharing few pictures of Riwaaj Eid dresses for women. Apart from Eid lunches and dinners, women can also wear this elegant collection on wedding ceremonies, parties and functions. If we talk about price range then all Eid dresses by Riwaaj collection are affordable. We are completely sure that every age of woman will definitely like this Eid collection. By wearing these elegant Eid dresses, women and young girls will definitely look more stunning and dazzling. All Eid dresses by Riwaaj collection include bright colors, high quality fabric and unique designs. Riwaaj outlets are located in all major cities of Pakistan. So all women who want to look beautiful on Eid they should visit Riwaaj outlet for buying these stylish and fashionable Eid collection. Just have a look and you will definitely set your budget for buying these dresses.